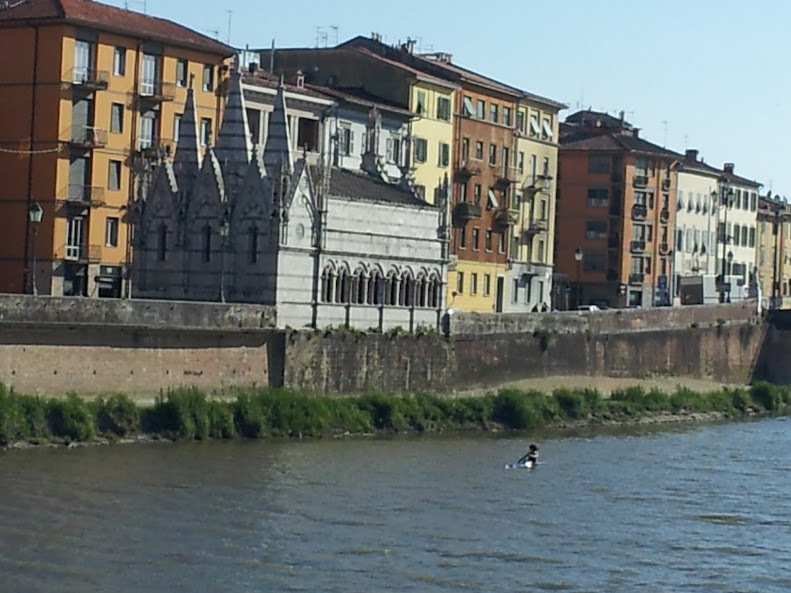 The sun is shining again on our final morning in Pisa. 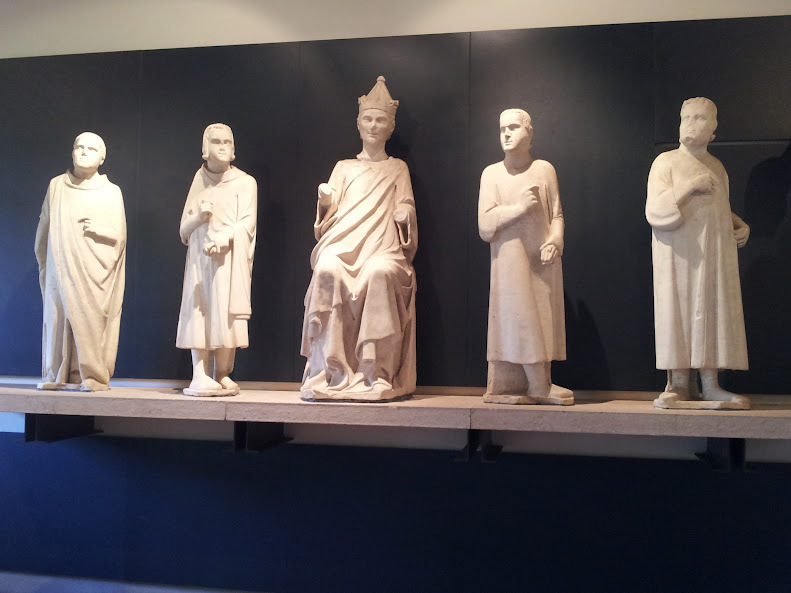 Before we check out, we walk over to the Museo dell'Opera del Duomo, where many of the original pieces from the Cathedral are kept. On the way, we get yet another angle on the tower. 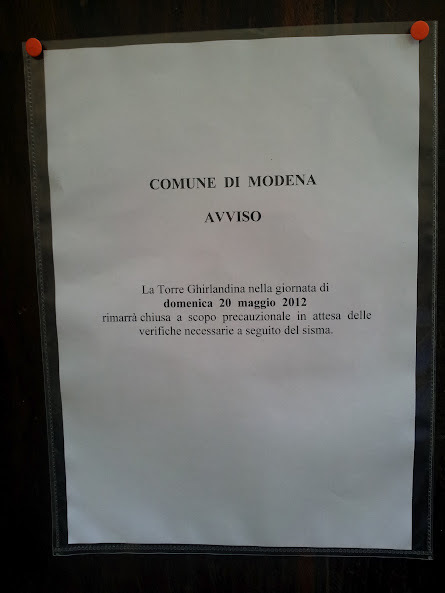 We have usually had very good luck with Duomo museums and this one is no exception. The museum is very nicely laid out with good lighting, good signage in English (a big plus for us) and some amazing things on display. 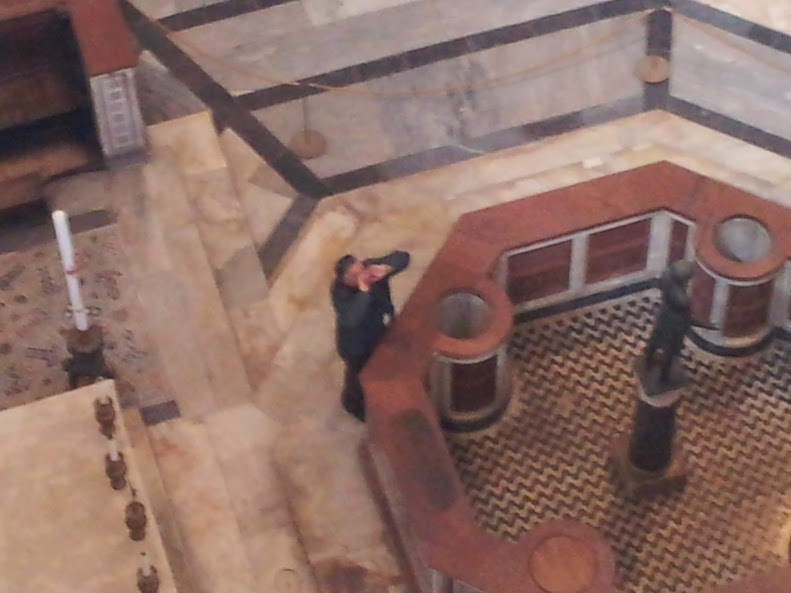 We spend more than an hour walking from room to room; for most of the time, we are the only people in the museum. 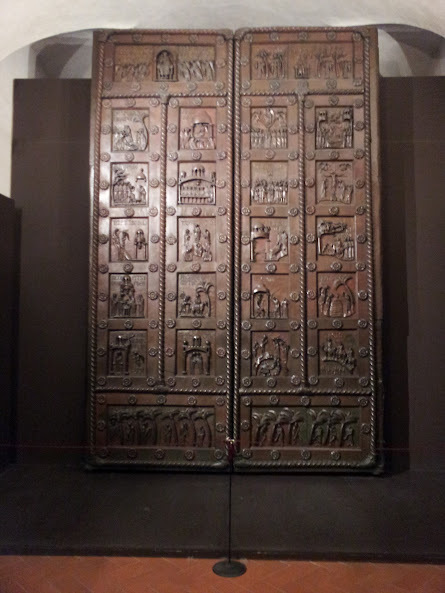 Here are pictures of some of the exhibits that we liked the most. 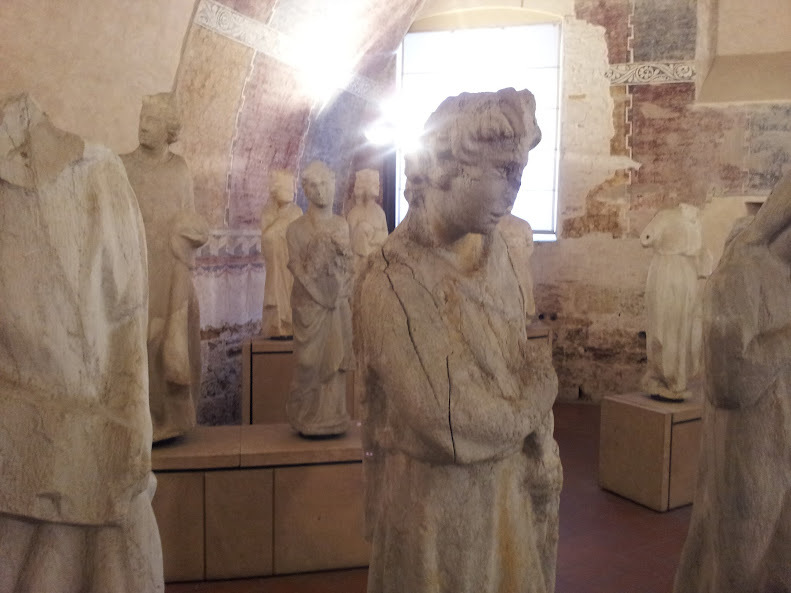 rooms full of statues and carvings from the outside of the building, some in rooms with frescoed walls. 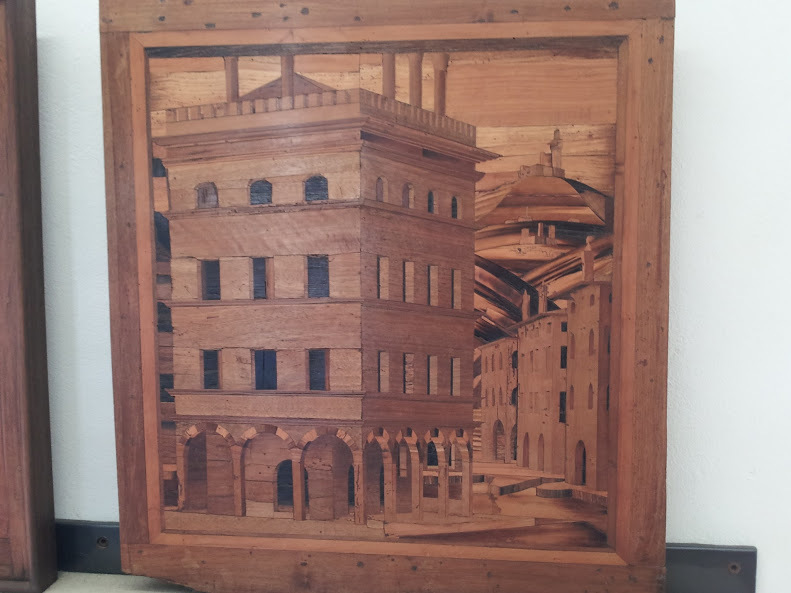 some terrific intarsia work--pictures and designs composed of pieces of colored wood.....amazingly intricate and beautiful. 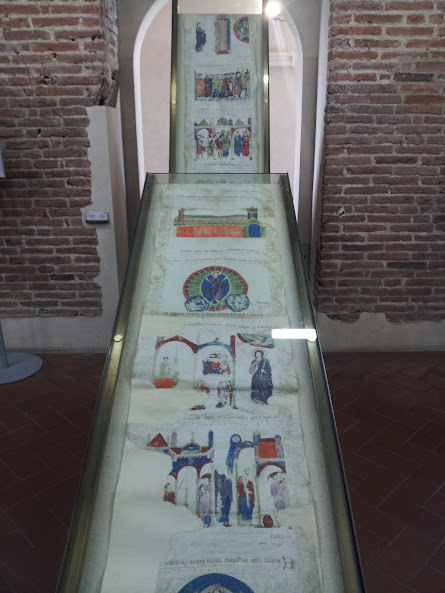 an lllustrated bible with text read by the priest and pictures visible to the congregation so they can follow along. 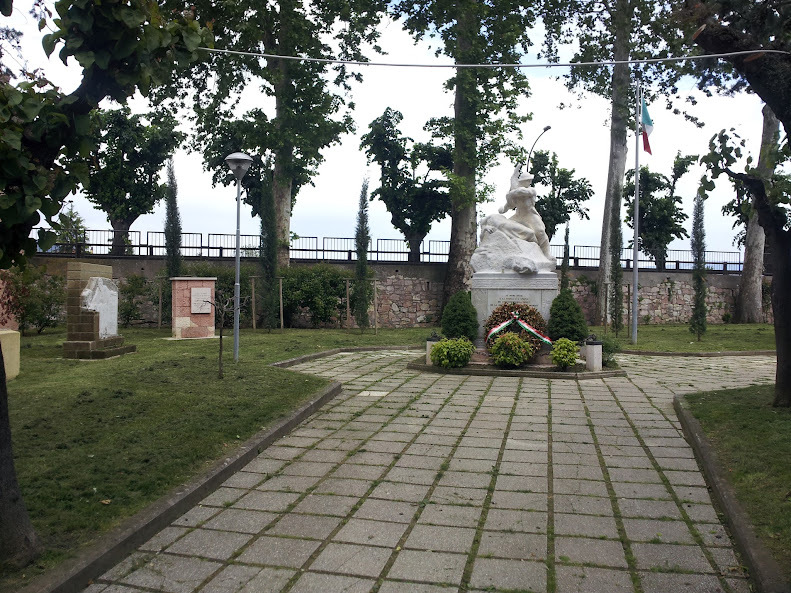 right under the Torre Pendente. 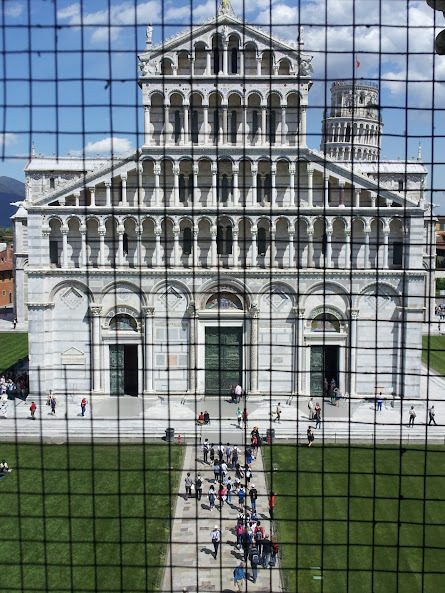 We have had a good time in Pisa--both exploring the city and revisiting the Piazza dei Miracoli. 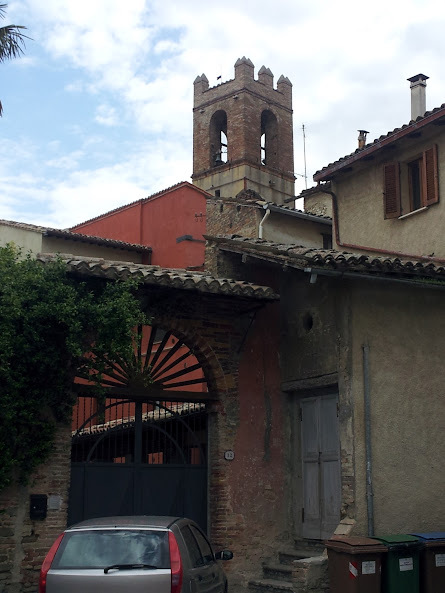 We get on the road and stop for our (almost) annual lunch of Tuscan fried chicken with vegetables in Lucca at the Vecchia Trattoria Buralli. Delicious as usual.....the frying is done in Jewish Tuscan style--flour first then egg, no breadcrumbs. 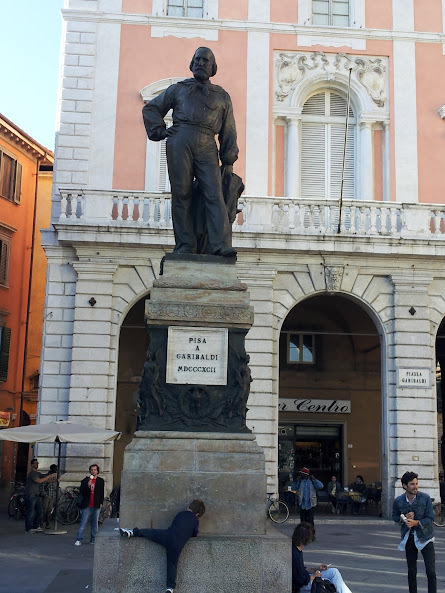 We stop to see our friend Paolo at the Piccolo Hotel Puccini but he isn't there so we get back on the road for our next stop--Cannara. 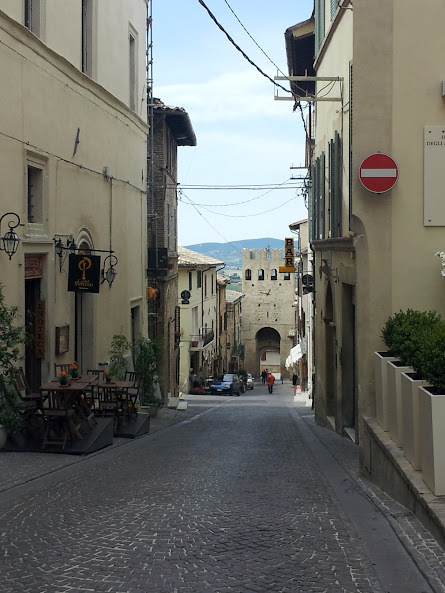 Cannara is a small town just outside of Perugia...we are staying at a new bed and breakfast in one of the old palazzos in the center--the Palazzo delle Signorine. 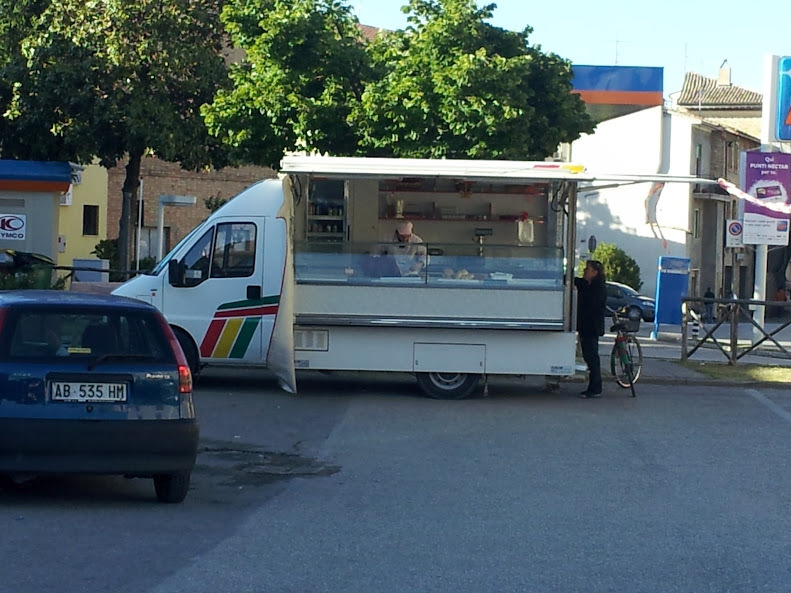 and a porchetta truck parked in the supermarket lot. 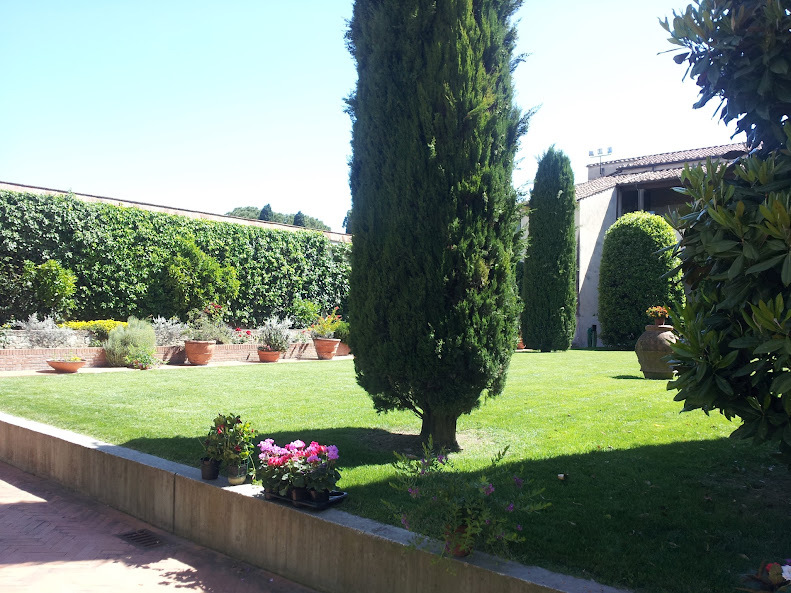 ....all valuable intelligence for our stay at the villa just outside of town where we are staying next year. 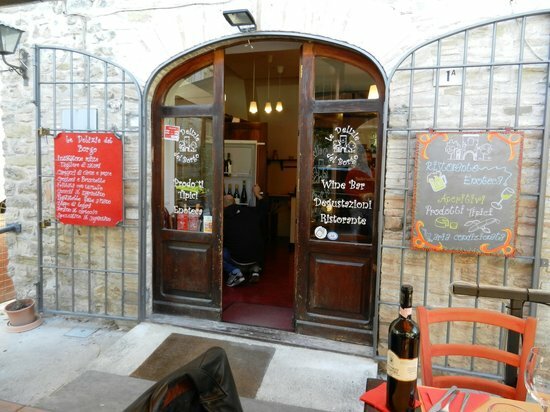 For dinner, we walk around the corner and eat at Per Bacco, where we had eaten in the summer of 1998 when Seth was studying at the University of Perugia. 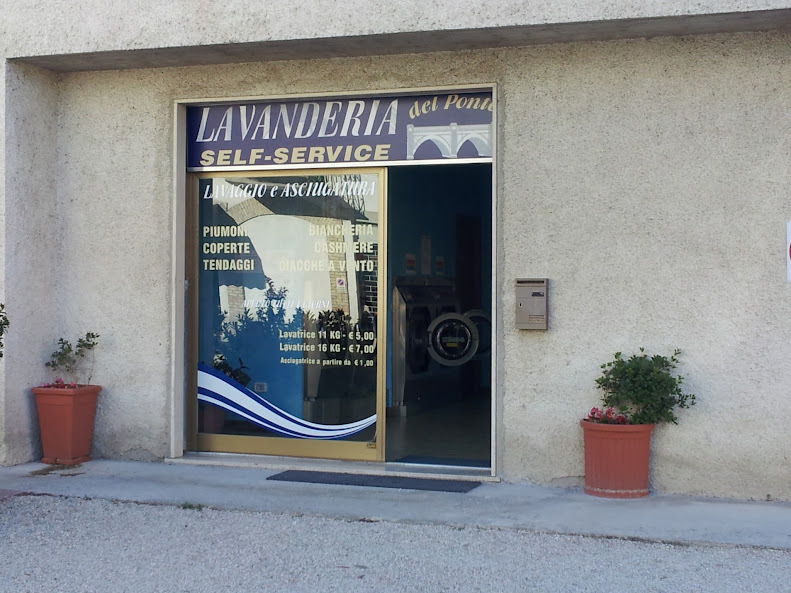 The place has been redecorated since our last visit but it is under the same management. The place is very pleasant but I think the menu is a bit too "creative" for me. Diana chooses the tasting menu--a plate of assorted appetizers, two pastas--gnocchi and tagliatelle, a veal cutlet and strawberries for dessert. 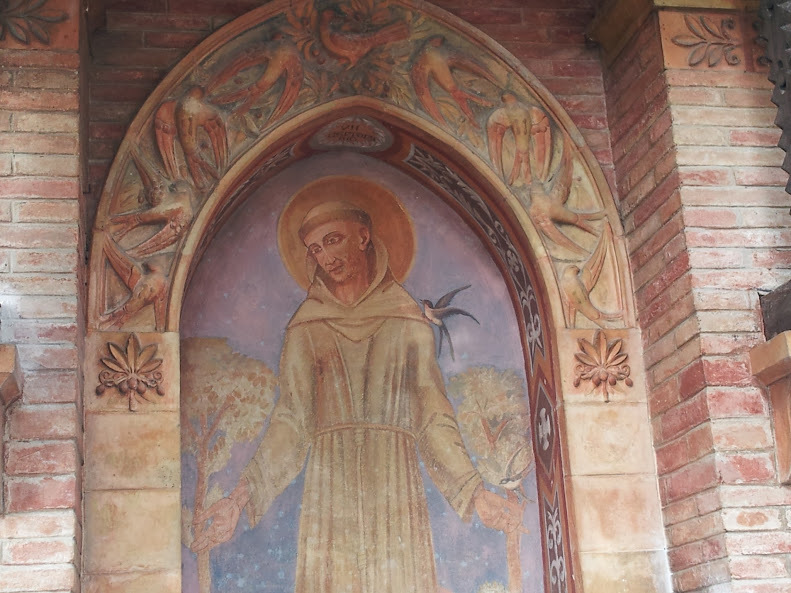 I have an onion based antipasto--Cannara is famous for its onions--a flan with onion cream sauce and bruschetta with an onion topping followed by a pasta dish with leeks and prosciutto. The owner is very charming and attentive to us until a couple of regulars walk in and he gets involved in long discussions with them. In any case, we don't think we will be going back there tomorrow...but perhaps we will give it another try next year. 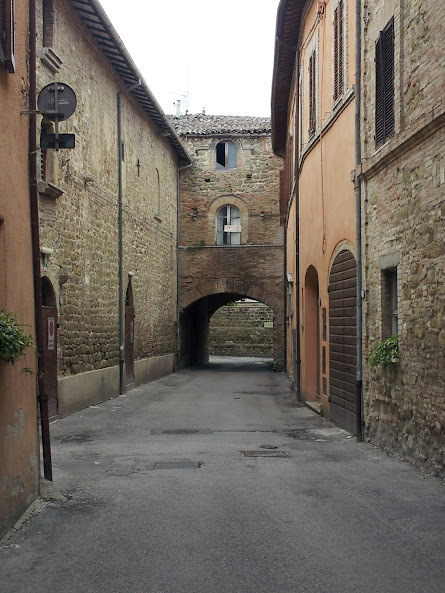 Back to our palazzo through quiet streets....tomorrow we are off to check out the Fattoria del Gelso. 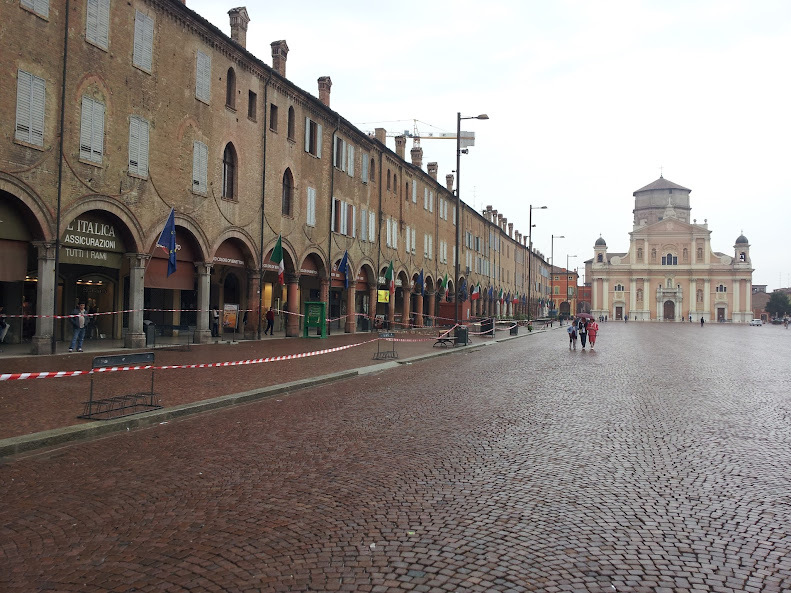 I am stepping out of sequence to report on the earthquake that took place near Modena on Sunday morning. We woke up at 4 am because the bed was shaking...not violently but steadily for about 20 seconds. 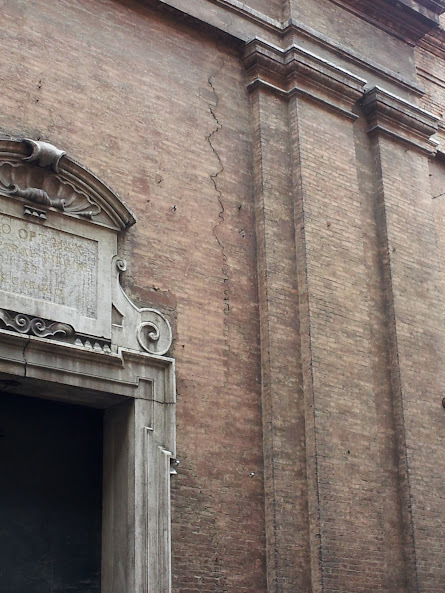 Diana felt that the whole building and room were rocking and she thought it lasted a long time. Then it stopped and all was quiet. We heard no street noise, no sirens, no commotion even after opening the window. We immediately thought that it might have been an earthquake and confirmed that there had been a quake with a quick search on my smartphone. But nothing else happened and we went back to sleep. We learned from the internet in the morning that the quake had been much more severe than we thought but all seemed normal at the hotel. 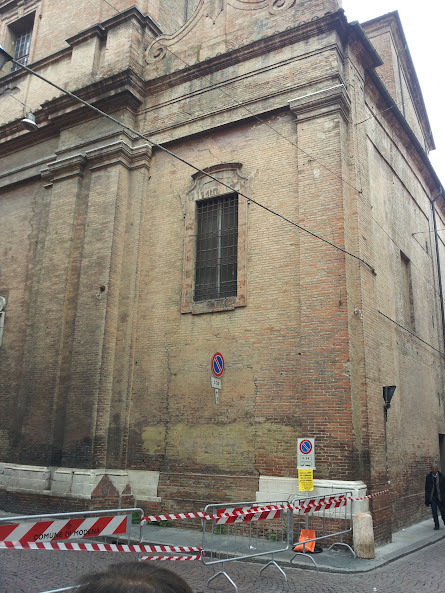 Only after we went out in the morning did we notice a lot of areas near older buildings roped off with tape. 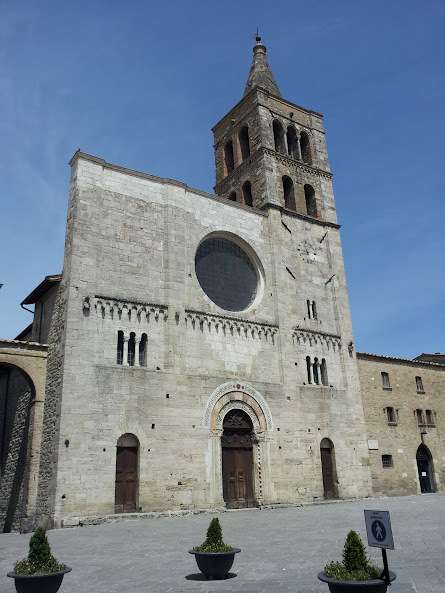 And when we got to the tall bell tower, there was a sign posted that it was closed so they could make sure there was no damage. But the cathedral was open as was the Duomo museum.....and people seemed to be going about their business normally on a cloudy, damp Sunday morning. 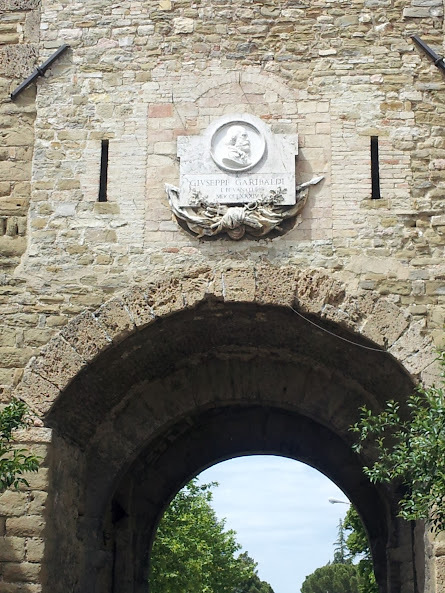 The effects were more evident when we drove to Carpi, a nearby city, planning to visit the museums there. 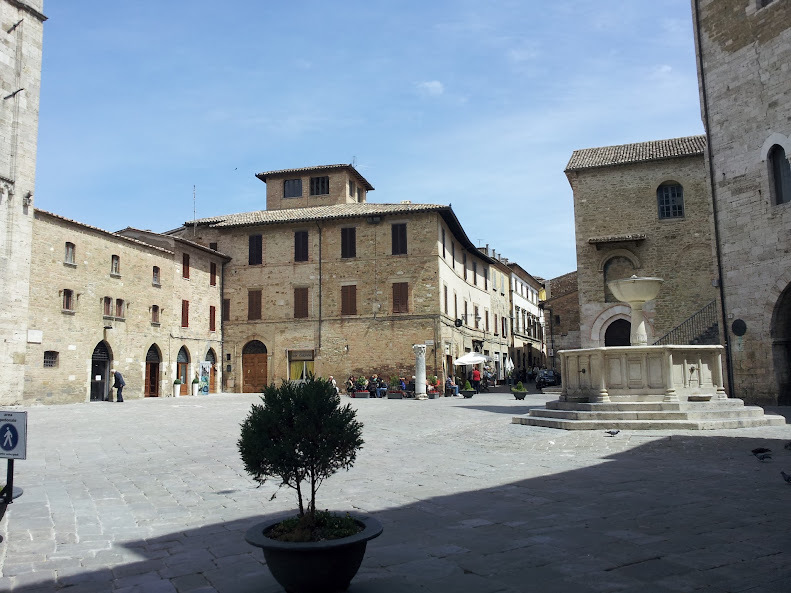 On the very grand main piazza, the castle that houses the museum was closed as was the Duomo. 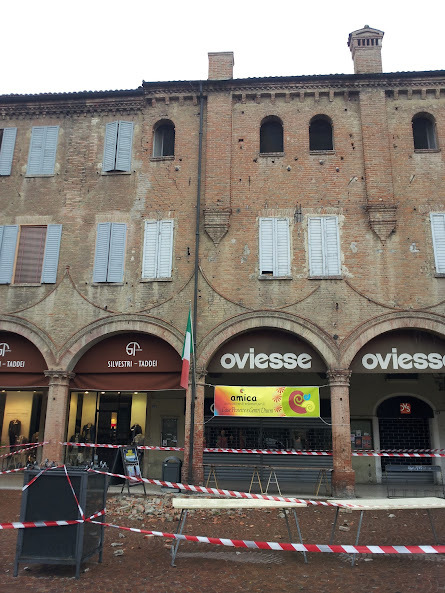 The area in front of the long porticoed side of the piazza was cordoned off because of the danger of decorative chimneys on the roof falling. 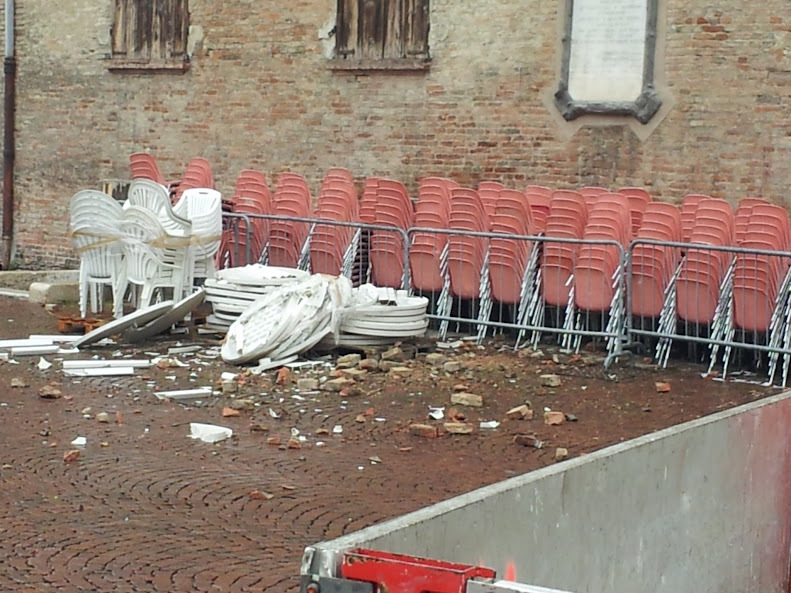 Across the piazza at the castello, the falling debris was even more evident. 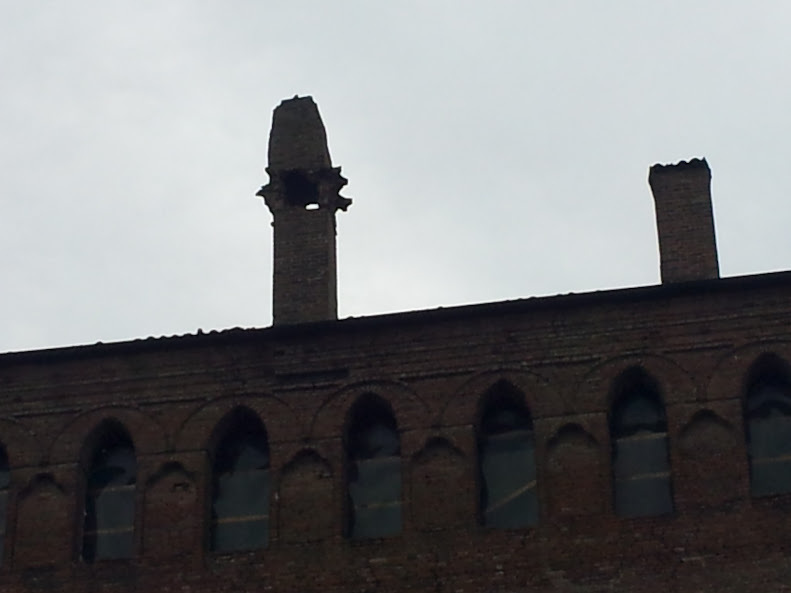 It's lucky that no one was standing underneath when the bricks began falling. You have probably seen the television reports of the extensive damage elsewhere in the area.....but we are fine. We continue to luck out in the weather department....a little cooler this morning but still clear and sunny. 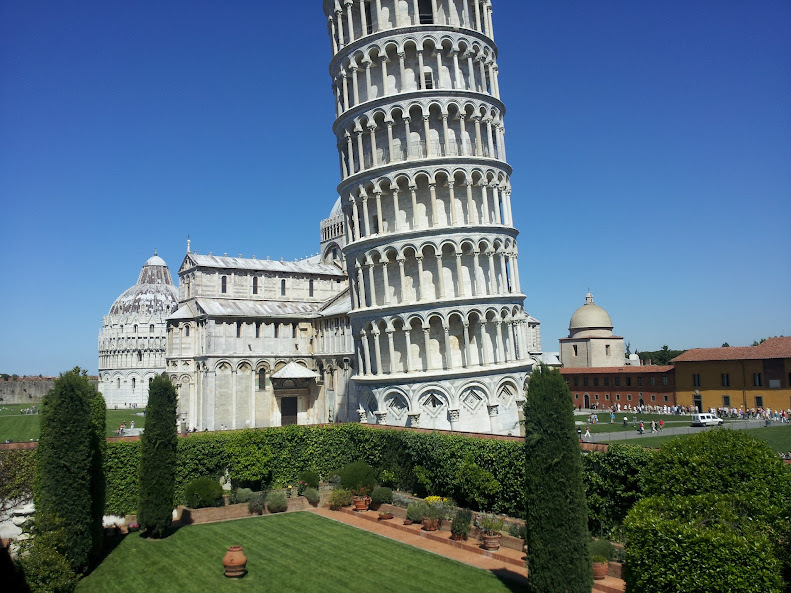 Breakfast again in the charming hotel garden and then back to the Piazza dei Miracoli to visit the Baptistery and Duomo. 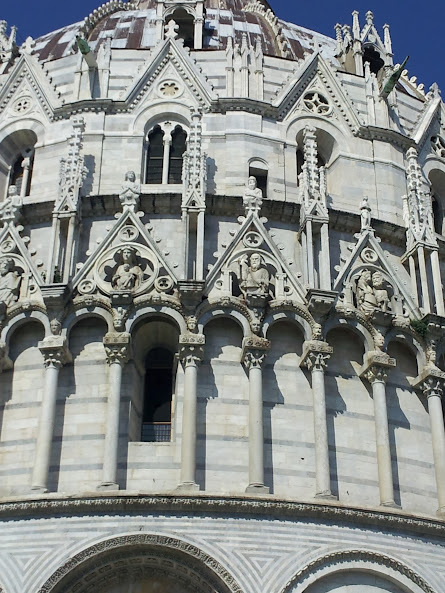 The Baptistery is a very impressive building...a very large structure with intricate carvings and sculptures on the exterior. 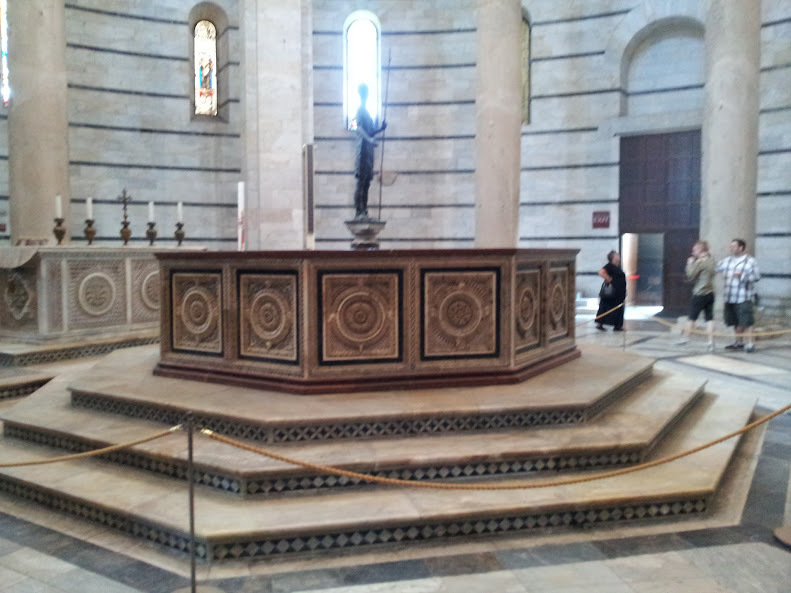 It was completed in 1363. 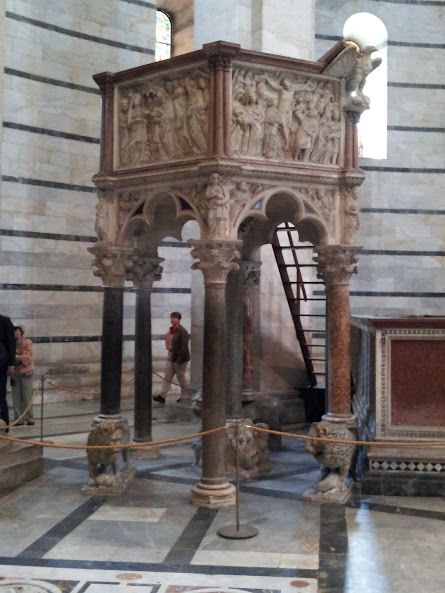 A notable feature of the Baptistery is the perfect acoustics...every half hour a staff member demonstrates how the sound travels and echoes and he is applauded by the people watching. 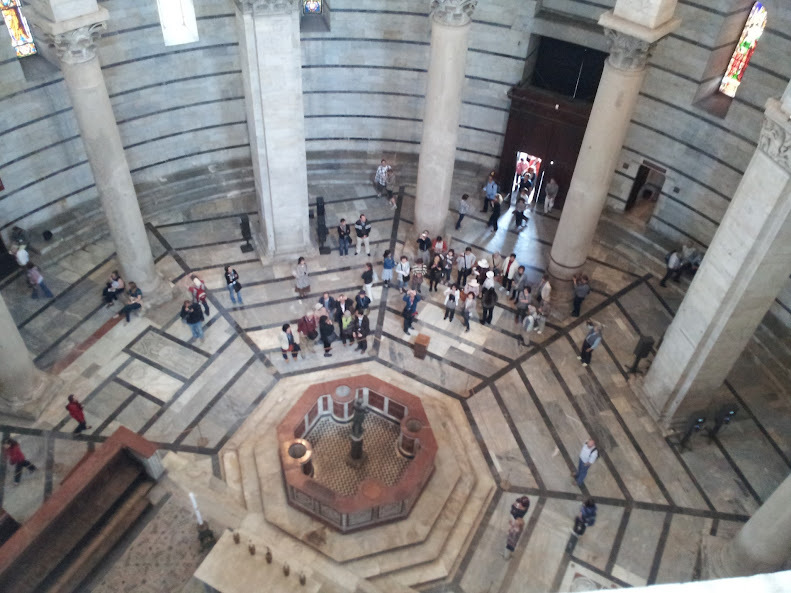 Here is the view from the second level that rings the building. 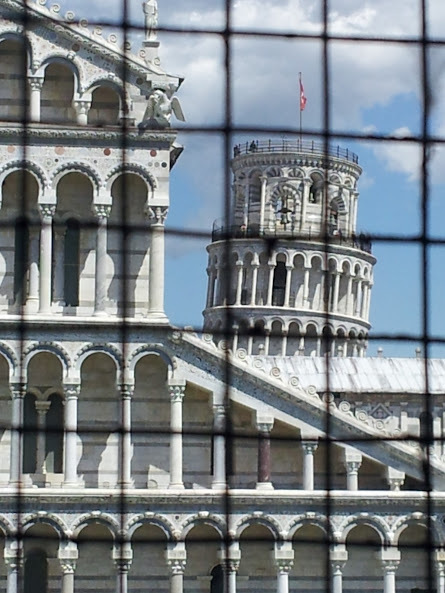 While I am on the second level of the Baptistery, I take two pictures that I like of the Duomo and the Tower from the grated window. 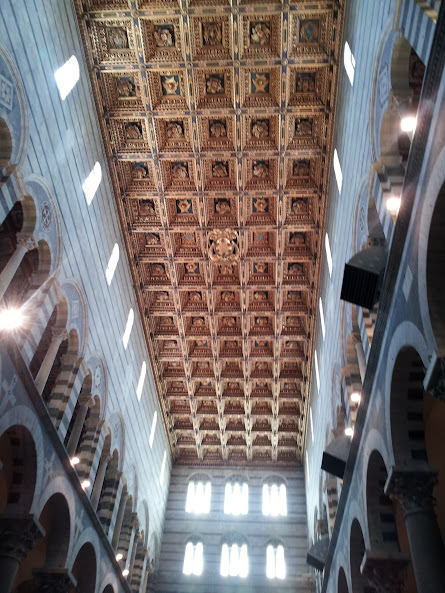 The Duomo--which is earlier than the Baptistery (begun in 1064)--has some very appealing features. 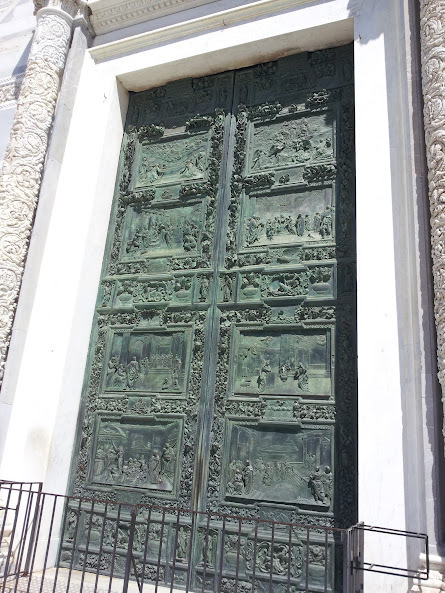 First, the bronze doors to the center entrance, are very impressive--the panels tell the story of the life of Christ and is the only original door remaining. 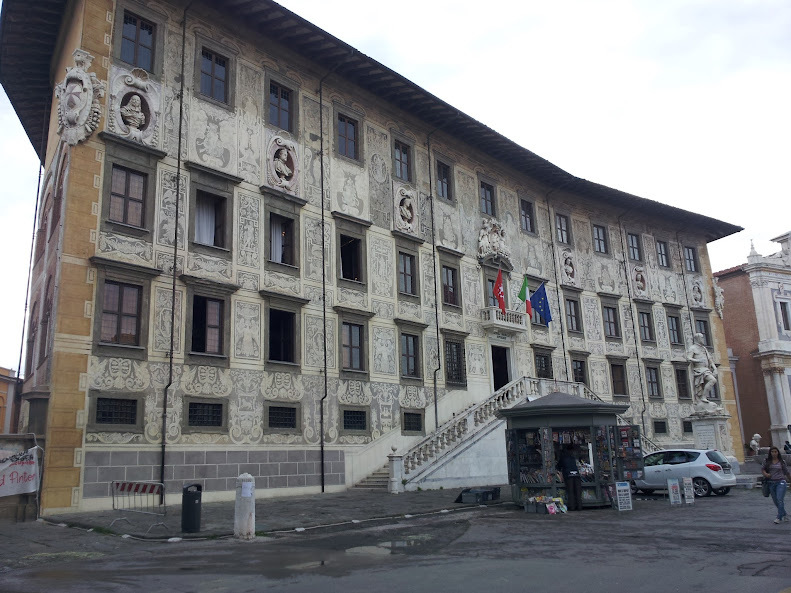 and has the Medici coat of arms displayed in the middle. 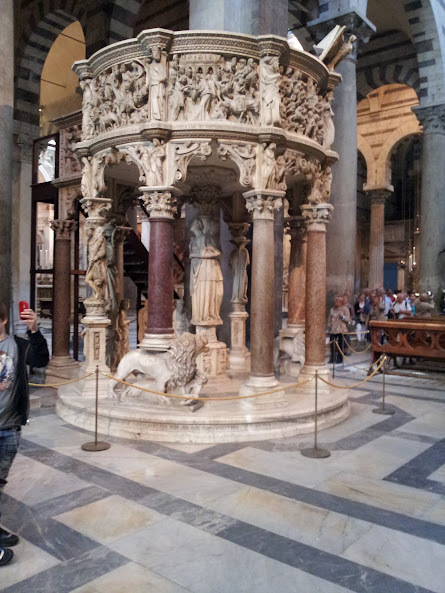 Ironically it was only re-placed in the Duomo in 1926 after having been stored away after the disastrous fire of 1595 which caused heavy damage to the building. 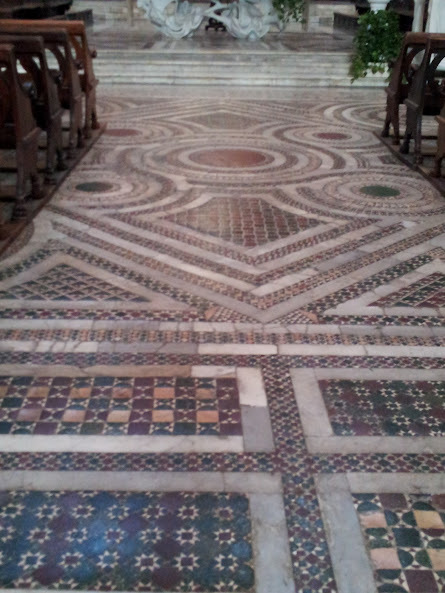 and Diana especially likes the tiled Cosmatesque floors. 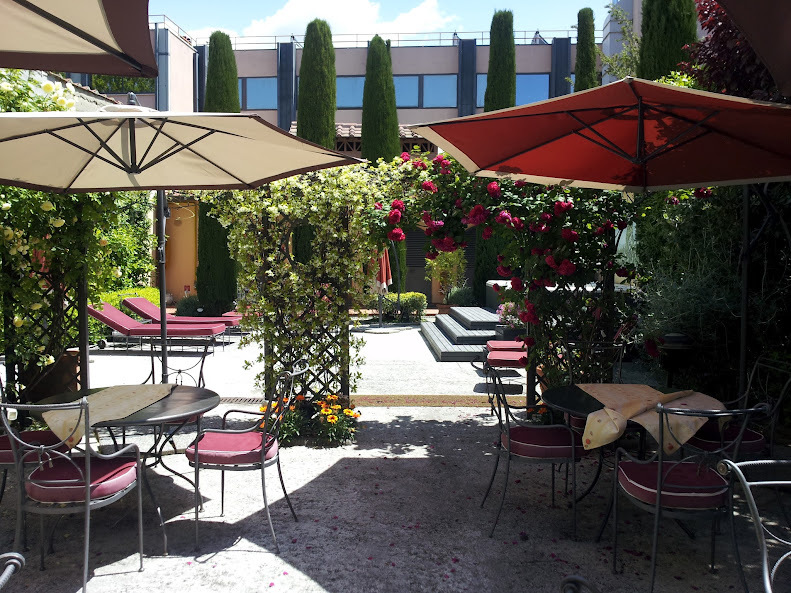 We walk back to the hotel and decide to have a light lunch in the garden since the day is so nice.....we enjoy the sun and the peacefulness. 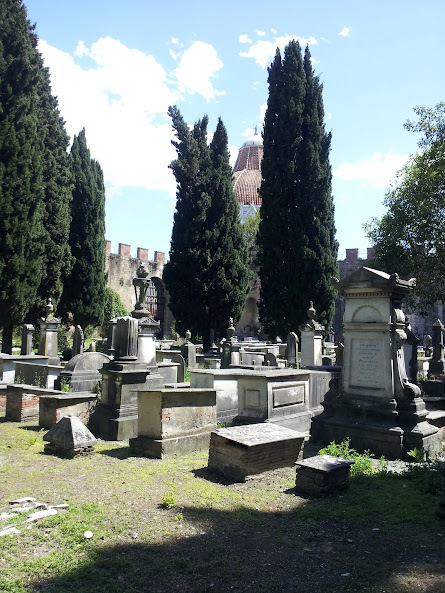 After lunch, we have arranged a visit to the Jewish cemetery which is located just outside the Piazza dei Miracoli behind the Baptistery. It is said to be the oldest continually used Jewish cemetery in Europe, dating from the 17th century. 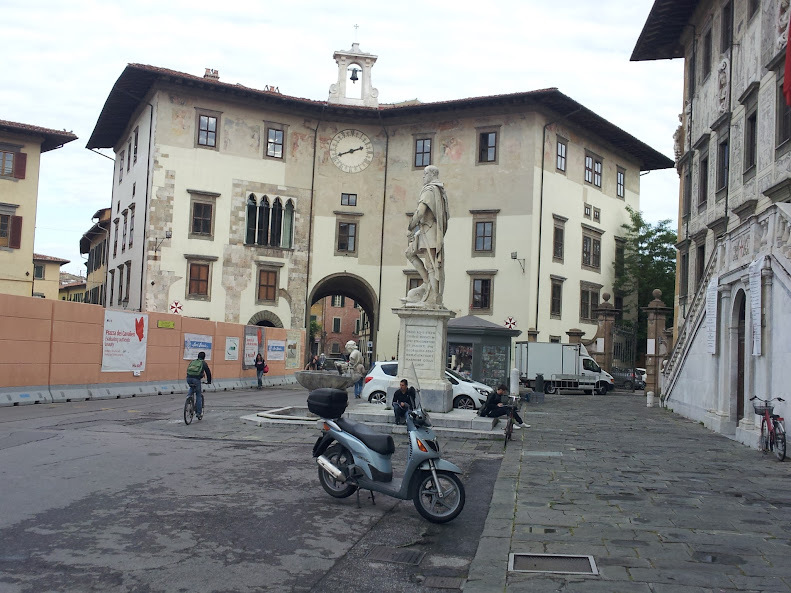 The Jewish community in Pisa was very similar to the community in Livorno--very integrated into the fabric of the city and there was no ghetto. 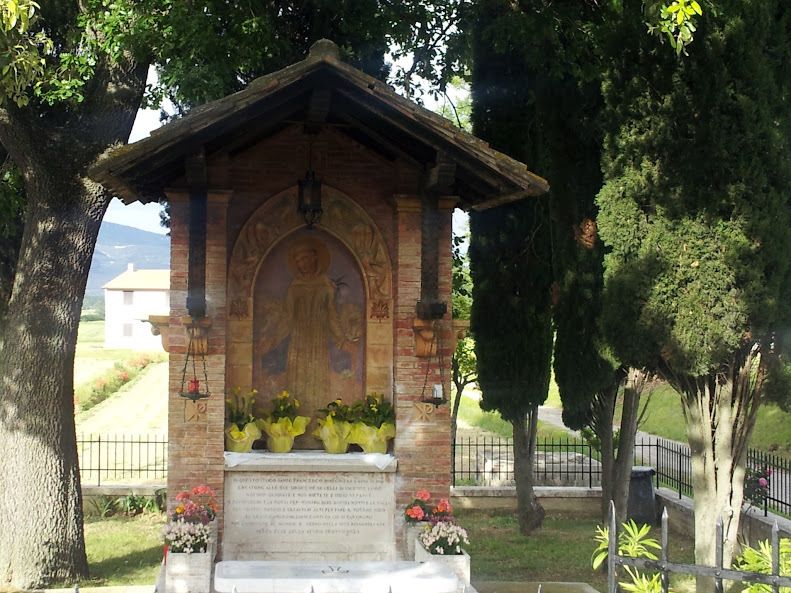 One of the graves tells that the person was Mayor of Pisa in the early 20th century. 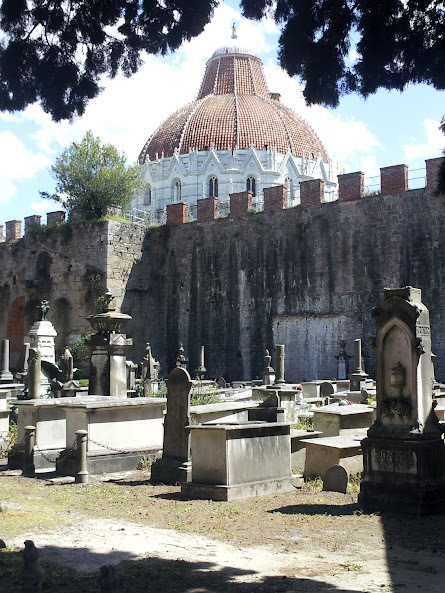 It is always a bittersweet, melancholy experience to visit these cemeteries....this one being in the shadow of the Baptistery gives it even more poignancy. 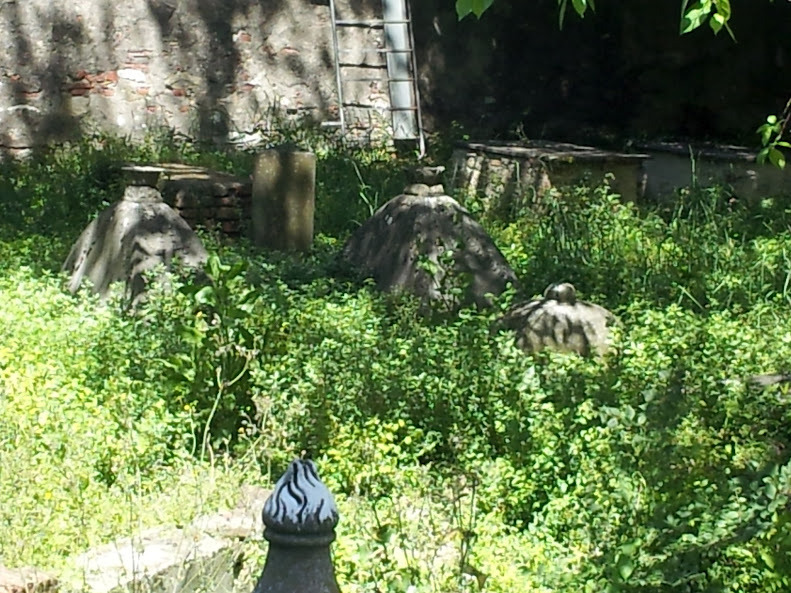 Parts of the cemetery are well kept up but others have become overgrown. 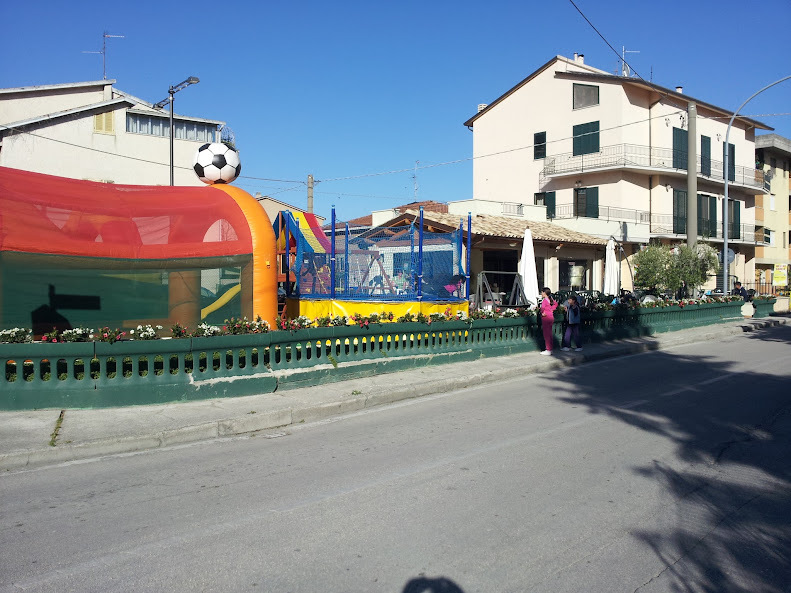 I take another walk around another part of town and find the vegetable market where i buy some good strawberries. We go out for an aperitif at one of the bars in the student section passing by a big celebration for a recent graduate who is wearing the traditional laurel wreath. The restaurant where I planned to eat dinner is full so we go to another place just down the street. I am a little apprehensive because there is no one eating there but dinner turns out fine...the people are friendly and the food quite good. 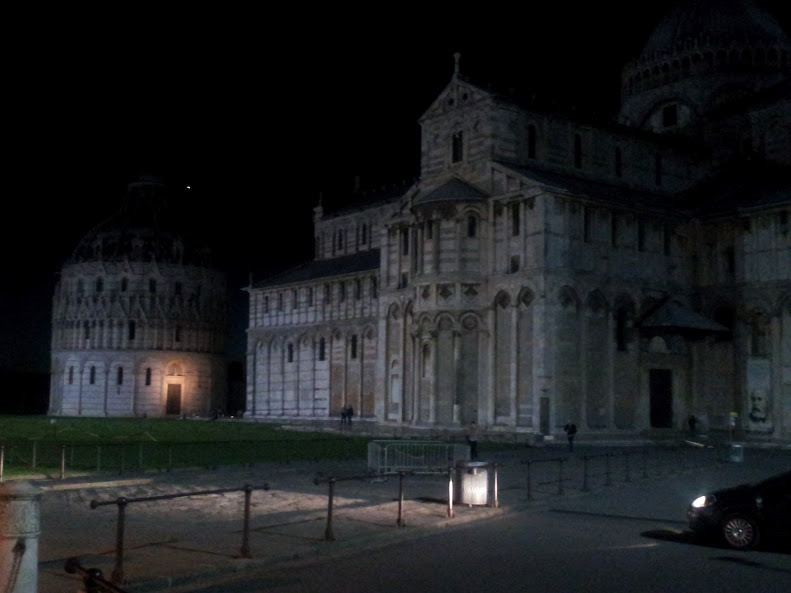 After dinner, we make a return visit to the Piazza dei Miracoli to see the buildings at night without the crowds....it is a very different experience. 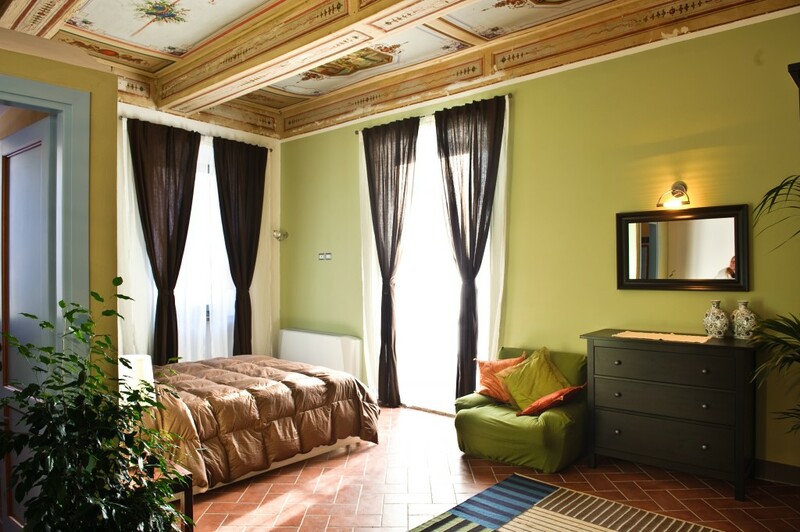 Tomorrow we head south to Umbria to check out the villa we are renting next year for the whole family. The sun is out again today....we have been mostly very lucky with the weather up to now on this trip. 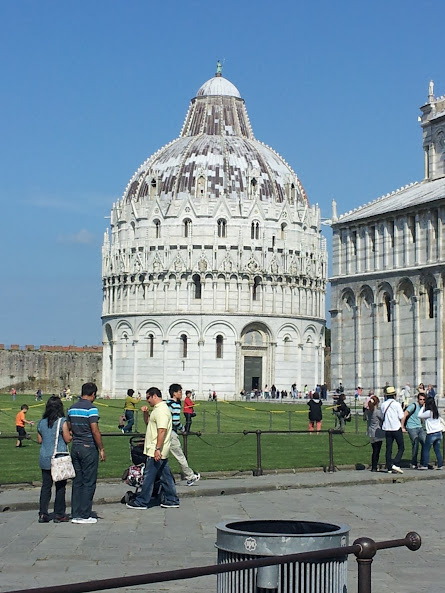 we walk over to the nearby Piazza dei Miracoli, the grassy field where the Leaning Tower, the Duomo and the Baptistery are located. 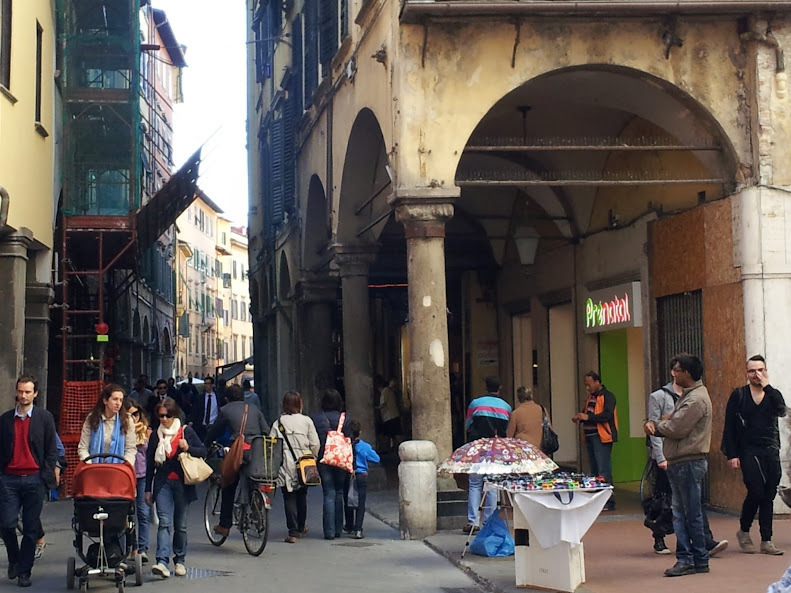 This is one of the most crowded tourist sites in Italy, lined with stalls selling souvenirs and there is a never ending stream of people flooding in from all directions. 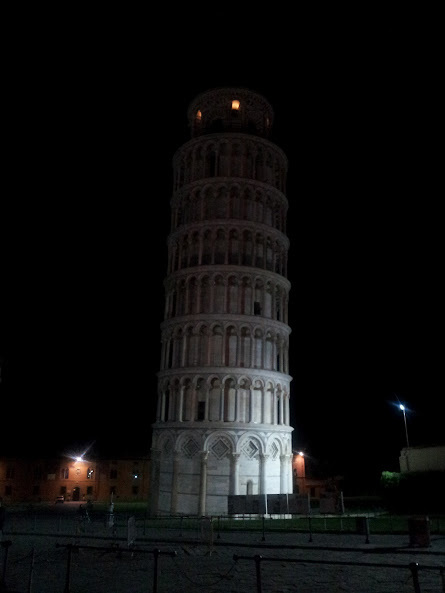 that somehow can handle the crowds, even all the people taking pictures of people holding up the leaning tower. 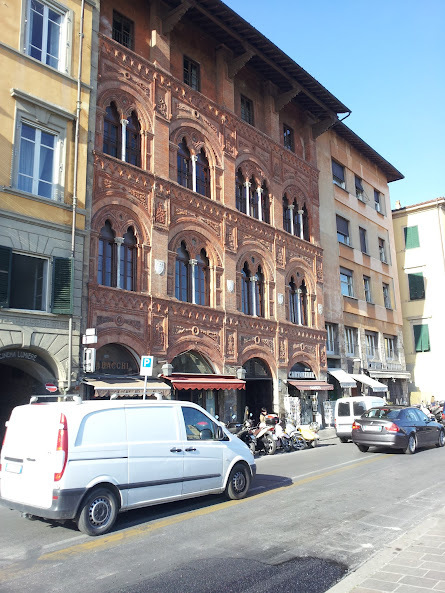 and the building with the clock that gives our hotel (Relais Hotel dell'Orologio) its name. 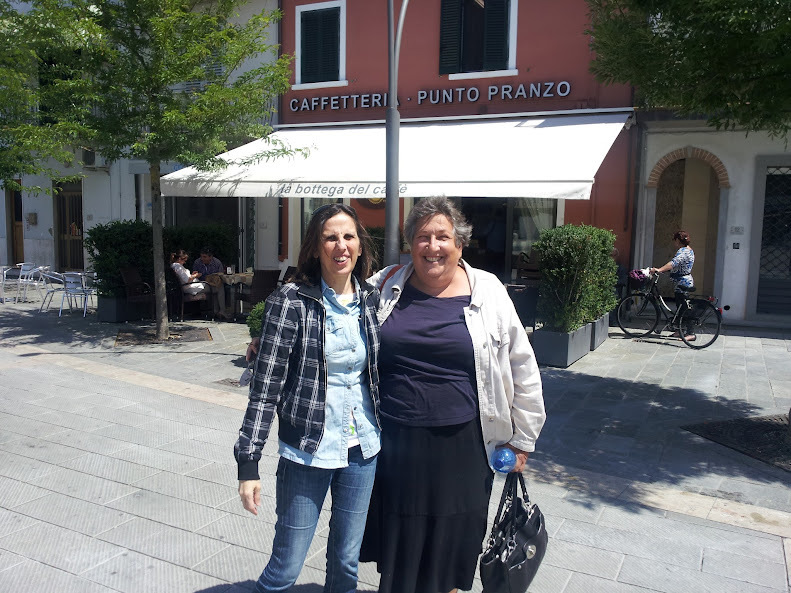 for lunch in Quarrata, a town near where she lives. 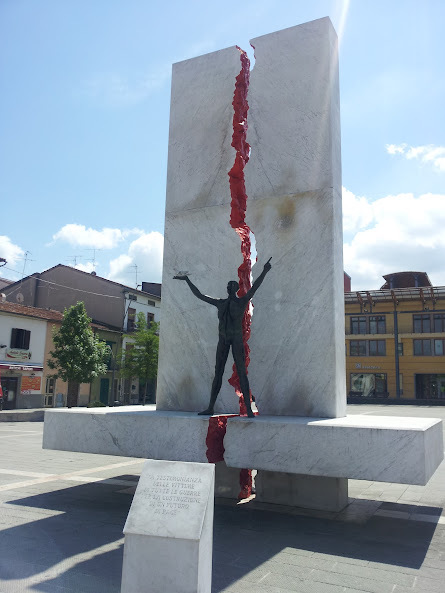 Quarrata has been called the ugliest town in Tuscany by some but we think that is unjust...although its modern piazza with this war memorial is a bit strange. Lunch is fine....and we have a good time catching up. 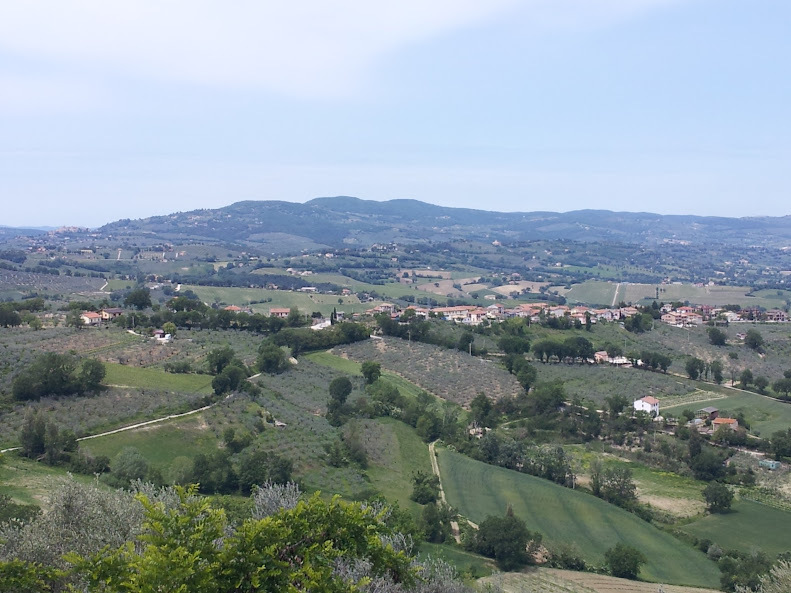 We try to drive back through the countryside but our first attempt ends us up on too narrow and curvy a road for our comfort so we turn around and try a different route. 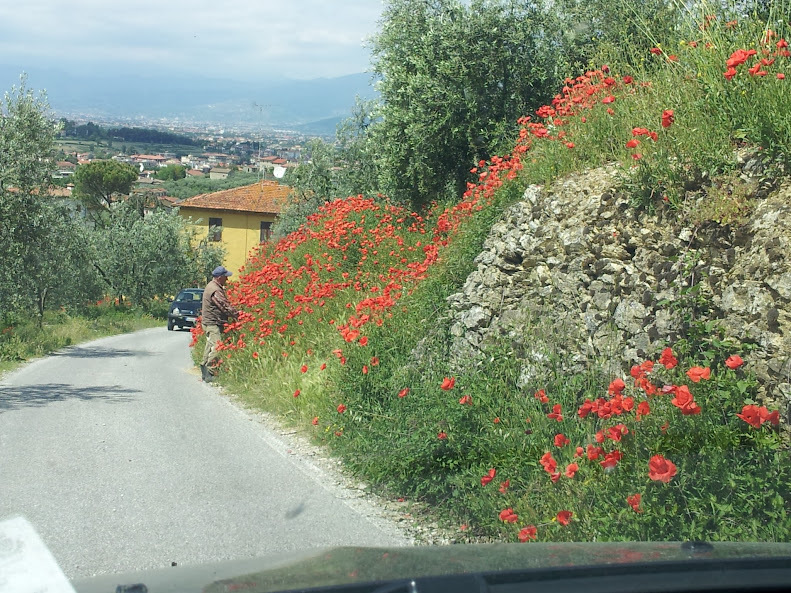 But we do pass a hillside with olive trees and poppies that are very striking. 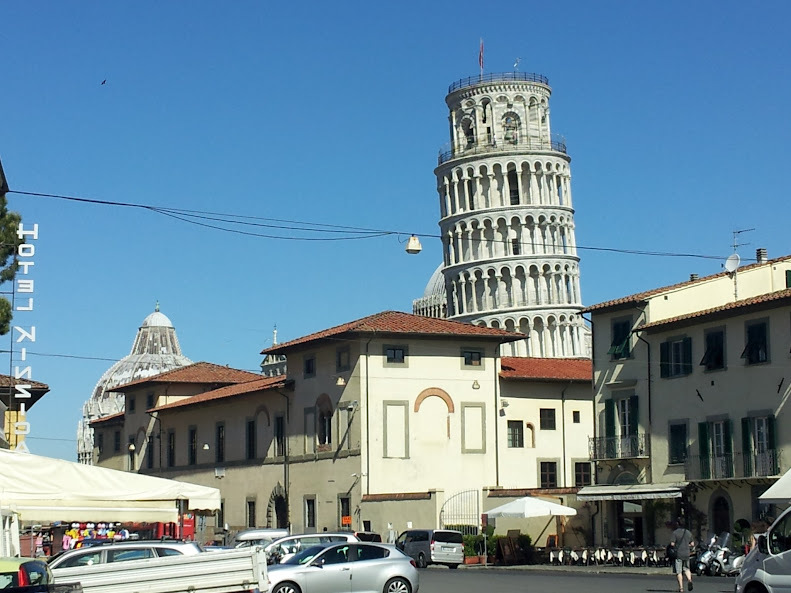 In this part of town, you wouldn't even know that the Leaning Tower and the enormous crowds of tourists was a kilometer away. 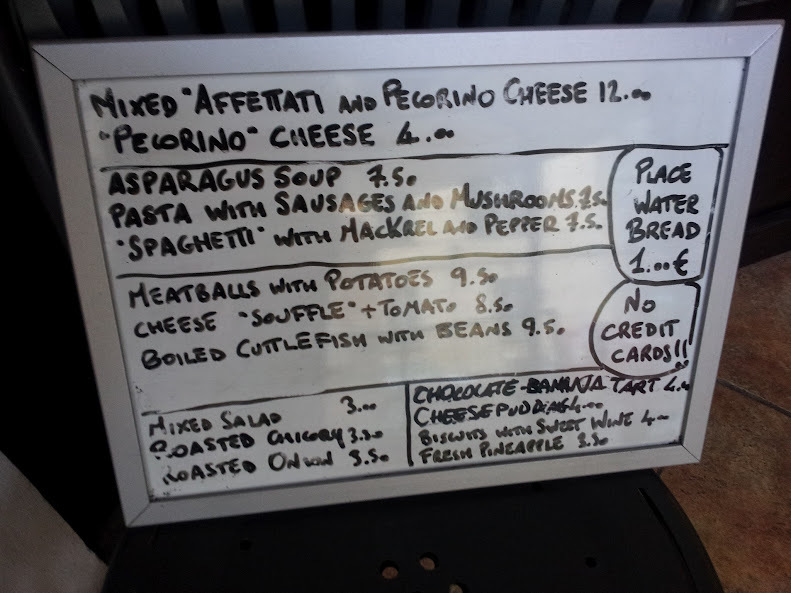 but dinner is quite good...asparagus soup and mixed salami and cheese plate for Diana and pasta with sausage and mushrooms and meatballs for me. We drink a local Pisan red with dinner. 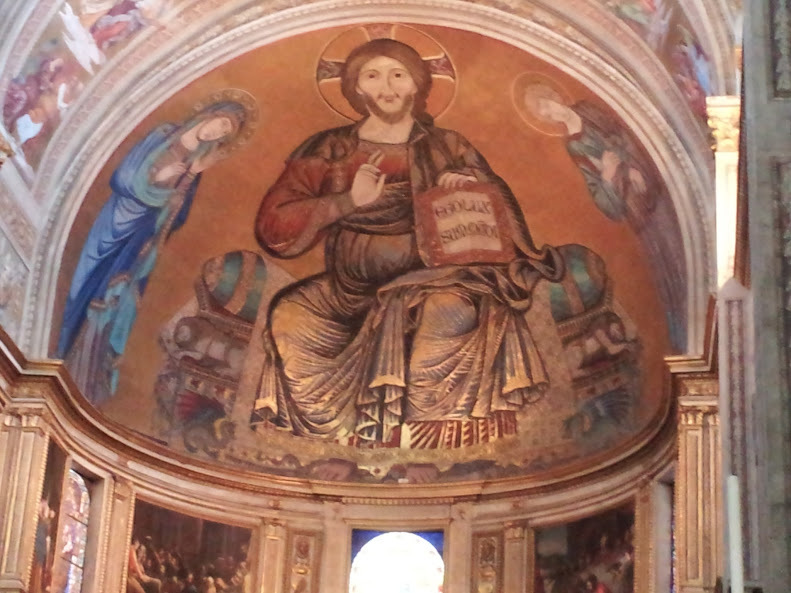 Tomorrow we will visit the Baptistery and the Duomo.